The HTS60 is a strong all-season light truck, crossover and SUV tire that provides fuel efficiency with the perfect synergy of comfort, duarbility and performance. Born from competition and adapted for the highway, Duragen technology provides even treadwear for longer mileage and confidence in harsh driving conditions. Promotes enhanced steering response and provides reliable performance when braking, accelerating and cornering. EcoRide Technology improves fuel economy by reducing rolling resistance and is designed to minimize CO2 emission to support a cleaner, greener planet. 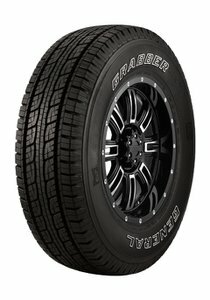 This strong all-season light truck, crossover and SUV tire provides fuel efficiency with the perfect synergy of comfort, duarbility and performance. Born from competition and adapted for the highway, Duragen technology provides even treadwear for longer mileage and confidence in harsh driving conditions. A blend of technologies that provides a quieter, more comfortable ride without sacrificing responsiveness. Promotes enhanced steering response and provides reliable performance when braking, accelerating and cornering. 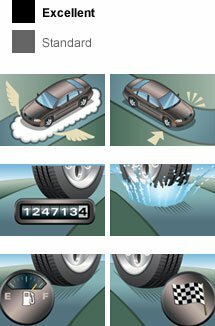 EcoRide Technology improves fuel economy by reducing rolling resistance and is designed to minimize CO2 emission to support a cleaner, greener planet.